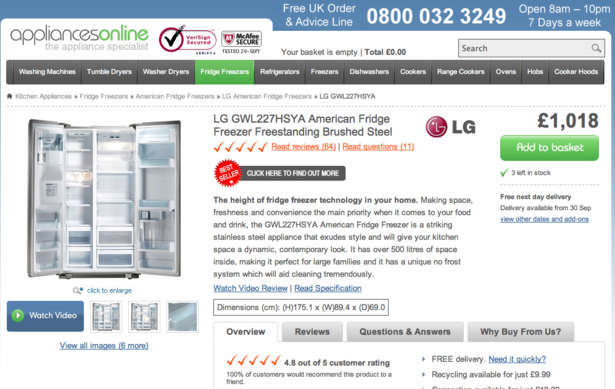 Appliances Online has been making some improvements to its product pages recently, and has let me in on the process and the results, which includes a 9.5% jump in sales. With the help of videos showing users interacting with the product pages, the retailer was able to both identify improvements, and check that they had the desired effect. Appliances Online commissioned user testing videos from Whatusersdo (we have used its videos in some of our site reviews), 125 in all. This is a lot of video, and meant a lot of work identifying potential improvements, but it did give the retailer a broad range of opinion to inform decision making. I introduced user- centered design, but I had to get the business bought into it. So I did this by buying 125 videos from WhatUsersDo, where you set a task for a customer to go away onto your site and try and make a purchase. This gave us 250 hours of footage, which was too much content to watch through. So I used crowd sourcing… We gave five videos to each senior manager including the CEO and this gave us insight into what we needed to change from our proposition, the size of the images to where we put the buy button and it actually gave our customers a voice which went directly to the managers. The company used the videos in conjunction with other tools, such as Click Tale, which provided heatmaps showing which elements of product pages users were interacting with the most. Clear calls to action are important, and factors such as size, colour, and context on the page can make them more or less visible. In this case, the buy button was easily lost in the background of the page, as this tester explains. The “banners’ were eliminated by combining the messages into the copy on the page, and the buy button was moved above the fold. The colour was also changed, and the new green button now stands out more, while the text ‘add to basket’ is more descriptive. The user experience when attempting to view a product review was another factor that could be improved. The solution was to embed the video into the product pages, which was less interruptive, while consumers can also scan up and down the page looking at reviews and product specs, and the video stays still. A nice touch. In addition, this unique copy is much better from an SEO perspective. If other online retailers are just using the same standard product descriptions, then Appliances Online can stand out in search results. User-centric design is a continual process. Now the journey has completed its first cycle, it’s time to re-test, re-design and re-optimise. Post project user videos are vital. Not just to confirm the changes you’ve made were the right decisions, but also to test the journey has not been damaged and to kick start the next round of analysis. Why is online customer service so bad? For many businesses, the internet is one of the most important channels. Every day, millions upon millions of companies interact with their customers on the web and through internet-connected devices. But despite the internet’s importance, online customer service often leaves a lot to be desired. Why is that? There are a number of reasons, all of which can be dealt with. Is PayPal Access a bad idea for online retailers? The PayPal brand has become synonymous with ‘online payments‘, and despite the fact that the company isn’t the newest kid on the block, it’s no surprise that it keeps growing like a weed as commerce continues to move online. John Donahoe, the CEO of PayPal parent eBay, however, thinks that online payments should make up a much greater percentage of global payments than they currently do and as a result, PayPal is aggressively working to expand its footprint. One of the newest ways PayPal appears to be doing that is through a new offering called Access, which is reportedly set to be announced today at its X.commerce conference.